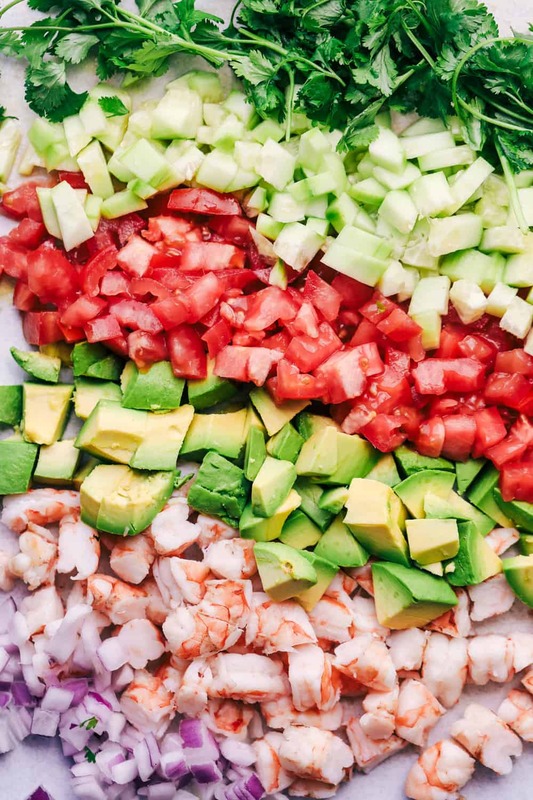 Avocado Shrimp Ceviche is made with so many fresh ingredients and so easy to make! This is always a hit where it goes! We also love these other recipes that have fresh avocado as an ingredient. Italian Avocado Cucumber Salad, Berry Avocado Salad with Creamy Raspberry Dressing or Strawberry Avocado Spinach Salad. I was introduced to ceviche at a summer barbeque last summer. I had never heard of ceviche before and was quite intrigued. I always love something that involves fresh ingredients. 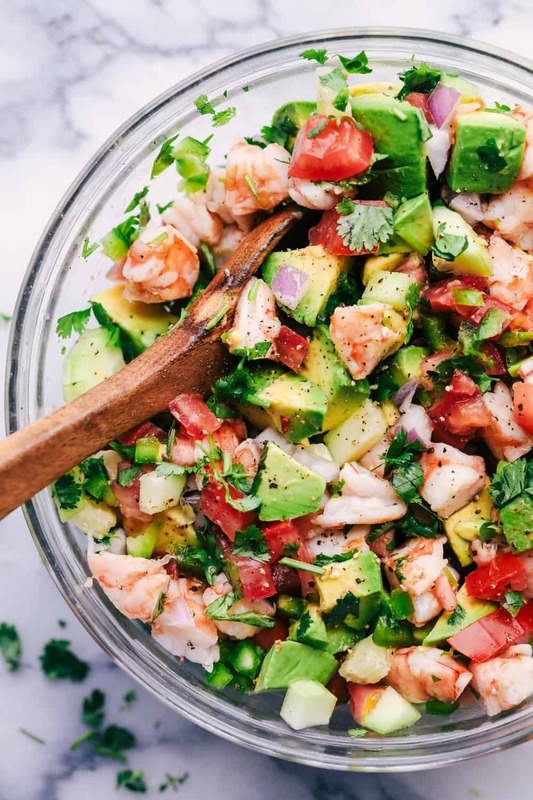 Shrimp, cucumber, tomato, cilantro, jalapeno, and red onions all get tossed to make this ceviche. I decided to add some avocado to the mix and it turned out just as amazing as I remembered. You add some fresh lemon, lime, and orange juice and all of the fresh ingredients really combine for amazing flavor. What are the ingredients of ceviche? Is the shrimp cooked or raw? Traditional ceviche consists of raw seafood tossed with an acidic marinade. The marinade “cooks the fish. Let it sit in the lime juice for 5 minutes until the shrimp turns opaque. 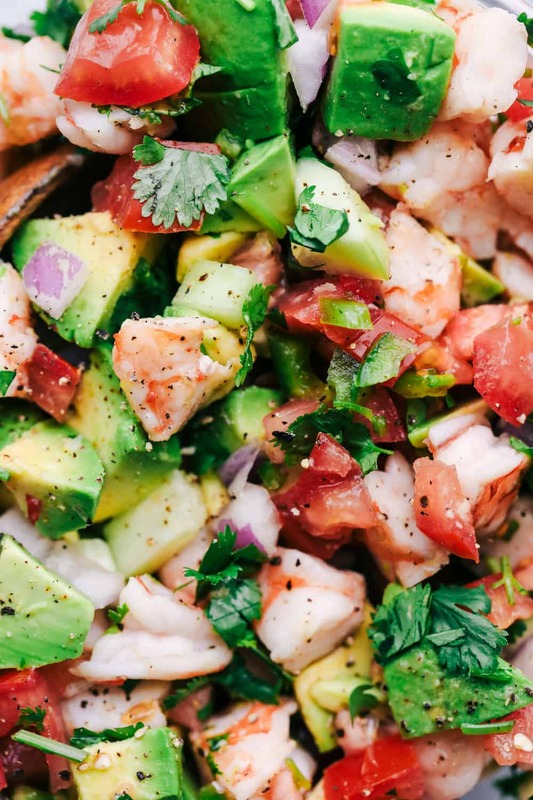 How long can you keep ceviche in the refrigerator? I would store ceviche no longer than 48 hours. Pour off as much of the marinade as possible and keep the ceviche tightly sealed. When serving again, you can add fresh lime juice to adjust the flavor. In a large bowl add the shrimp and lime juice. Let stand for 5 minutes until the shrimp turn opaque. The lime juice will cook the shrimp. Add the tomatoes, onion, jalapeno, and cilantro and toss with the lime juice. Cover and refrigerate for an hour. Add the chopped avocados and toss right before serving and salt and pepper to taste. It takes far longer than 5 minutes in the lime juice. Maybe you meant 5 hours? Even then, that is not really enough. If you want it for dinner, start it in the morning, go to work, then chop the rest of the ingredients and mix. Other than that timing, this is a good recipe. How much cucumber in the ceviche? I like to use 2-3 cucumbers when making it. Hi. What can I replace for avocado if it is not available? Avocado is kind of one-of-a-kind. You can leave it out. It is a must thought for this ceviche. I made shrimp cerviche. Left shrimp overnight in lime/lemon juice and shrimp doesn’t appear opaque. What can I do? Being left overnight the shrimp will be cooked through. It may be the type of shrimp you are using that it did not turn opaque.